Whilst Jemeluk bay is the “classroom” for our freediving courses, The Liberty Wreck is our playground – or at least one of them. Although more susceptible to winds and currents once you have some training The Wreck is a great place to freedive. 110 metres long and lying in between 5 mts to 30 mts depth. This is the perfect place to practice your new freediving skills. The wreck is an underwater wonderland of marine life – schools of trevally, bream, fusilier and anthias mill all over and around the wreck, coming curiously right up to the freediver. 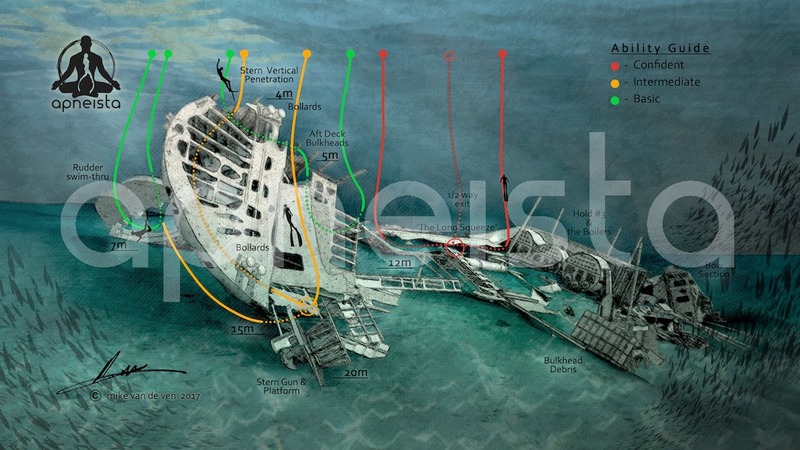 The wreck is brimming with life, with safe overhead environments and exciting swim-throughs. It’s a freedivers paradise, the perfect site to practice freediving for the sheer pleasure of the silent underwater experience. Situated only 20 minutes from Jemeluk. We regularly run trips here and armed with you new freediving skills, our instructors will guide you through the wreck, provide safety support and point out the many swim-throughs. To get the most out of freediving the wreck it’s better to get there early in the morning when conditions are best and before the many bus loads of scuba divers arrive to discover it. 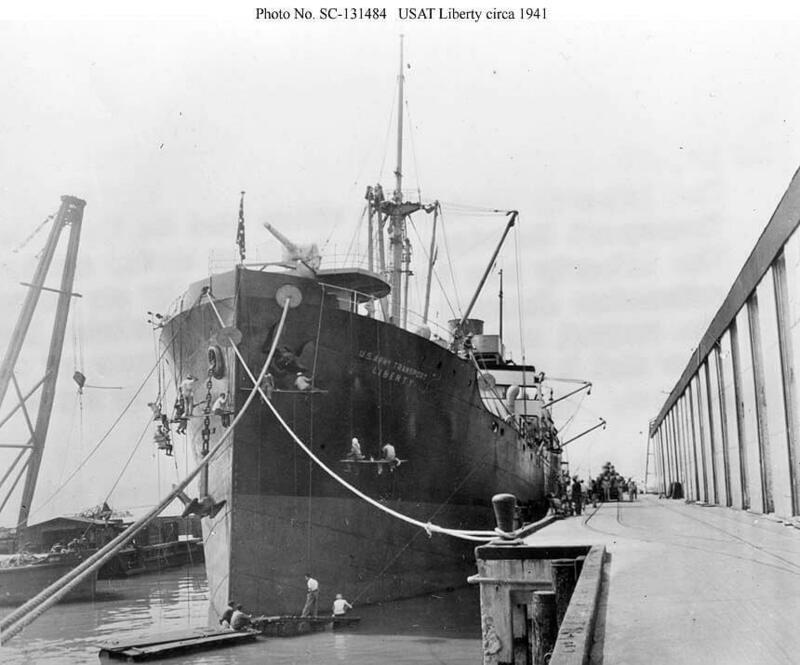 Discover the history of Liberty Wreck! The stern of the Liberty Wreck is the easest part to explore, we can dive from 5 to 20 meters depth and there is lots of beautiful marine life to be explored. When visibiliy is good, most of the wreck can be seen from the surface. Depending on your freediving level, we can do easy dives, dive through the rudder or do shallow dives to explore each part of the stern. If you are an experience freediver, we can dive close to the bottom and see one of the cannons of the Liberty Wreck. It has two, one on the stern and another on the bow. Our staff will show you all of these details and you will be able to imagine how incredible the ship was before it sank. We can also dive through a big hole at 11m depth which allows us to dive inside the wreck, go up through the penetration and exit through the other side. 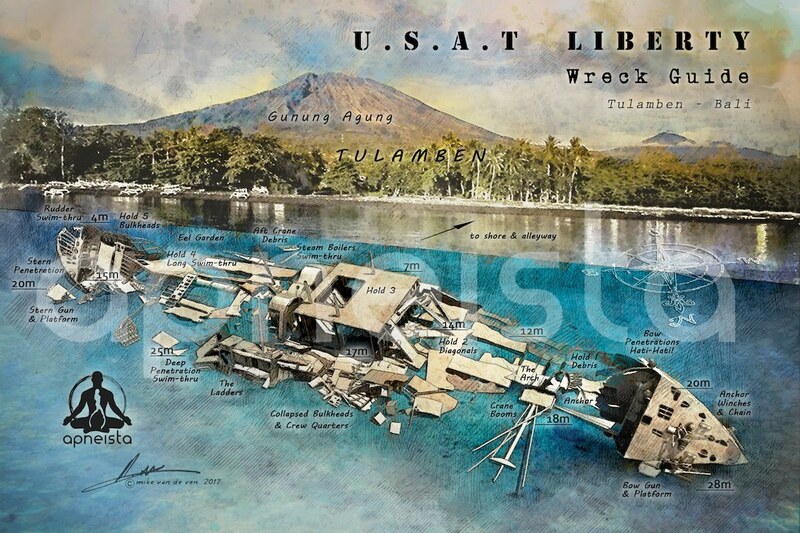 The middle part of the Liberty Wreck is one of the most interesting parts of the ship. We can see the engine boilers, holds, crew quarters and much more. Big fish such as green humphead parrotfish, grouper fish and turtles can also be spotted. We can dive from 6 meters to 25 meters here. The holds is a very nice place to start our dive. When we dive this part of the wreck, we can see a beautiful contrast of the light from the sun between the holes of the walls. Furthermore, we can explore and go through the gate at the top, pass through one of the doors or stay there for a while to observe our findings. If you are an experienced freediver, we can start our dive at the stern of the ship, go through the long tunnel and go out by the engine boilers. We can also dive through the deep penetration finishing our descent at 25 meters depth. The bow of the Liberty Wreck is probably the most advanced part of the excursion since we can dive between 12 to almost 30 meters depth. Although the visibility is good, it is often difficult to see the bottom from the surface. Experienced freedivers can dive to 10 meters depth where destroyed parts of the bulkhead deck can be found. When we reach the bottom you will see an arch, which we can go through and discover one of the anchors of the ship. Another possibility is to dive around the bow of the boat. This involves a descent to 28 meters depth where we can see the other cannon of the ship by the bow. We can surround the tip of the bow and ascend from here. The next dive is one of the most beautiful but also the most advanced. We start our descent down to 20 meters depth where we will see a hole. This is not for everyone as it is somewhat narrow. Once inside you will see the incredible contrast of the darkness of the passthrough and the clarity of the sea by the exit. Mike Van de Ven – AQD ltd. 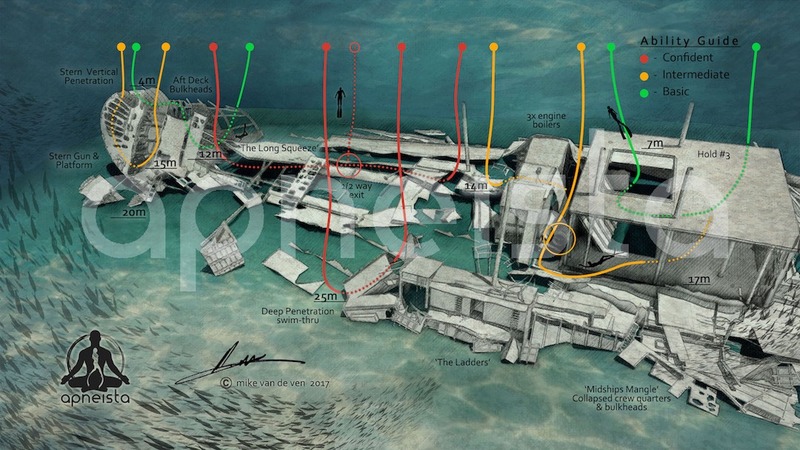 These incredible maps were created by Mr Mike Van De Ven, with support of the Apneista freediving tribe. 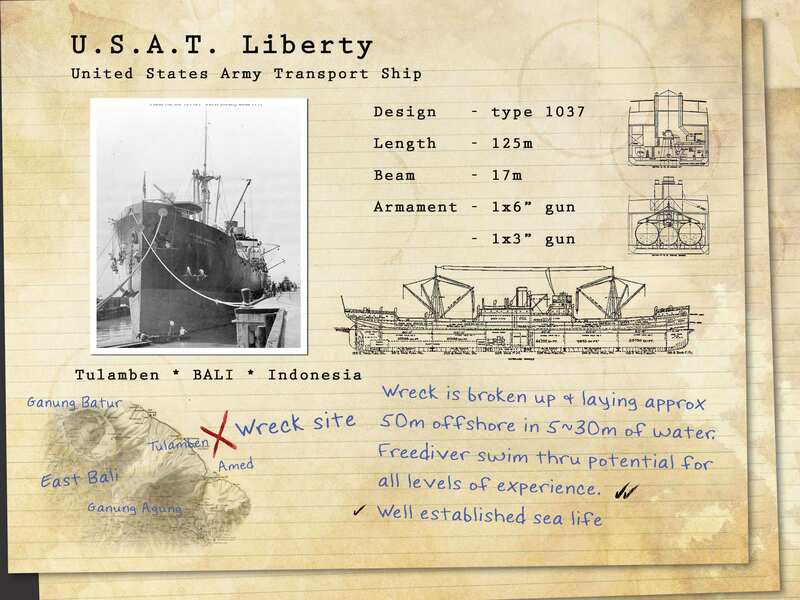 After deciding that the previous Liberty shipwreck maps were not very user friendly, Mike took on this epic task with an historians steely determination and an artists eye for beauty. The challenge was creating a coherent visual guide, making sense of a jumbled mass of wreckage strewn across the sea bed with sometimes limited visibility and extensive coral growth and rust. Through an extensive process of video recording , photography and historical research Mike was able to develop a 3d model of the original ship. 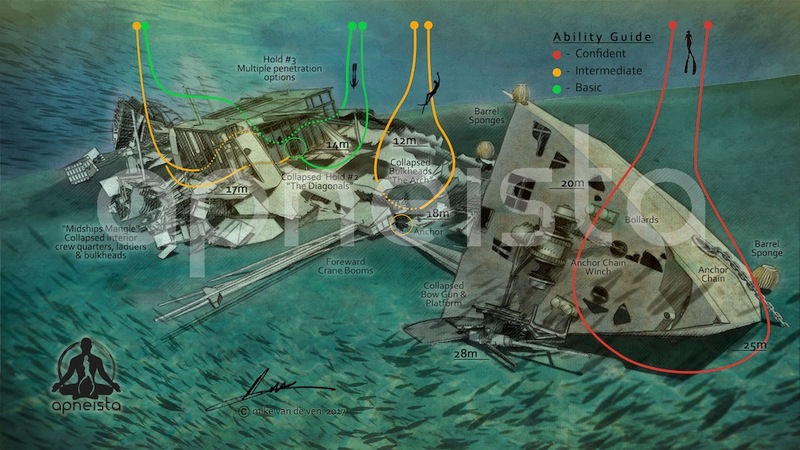 From this starting point he simulated the gradual changes and disintegration of the beached ship into the fascinating underwater shipwreck we see today. This journey of discover has uncovered new aspects and details of the wreck even for those of us who have dived it thousands of times. The end results are beautiful graphic representations which provide an invaluable reference to freedivers and scuba divers giving them a strong sense of orientation while underwater. 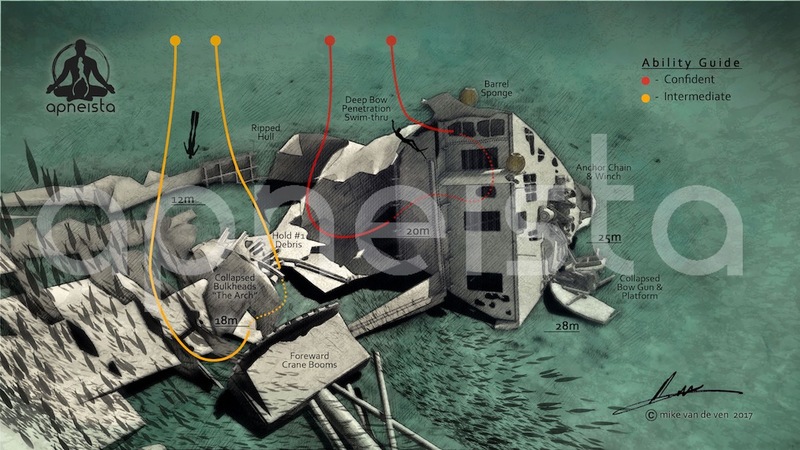 The artistic rendered images are exactly the result we had hoped for giving a more tangible connection to this amazing dive site. 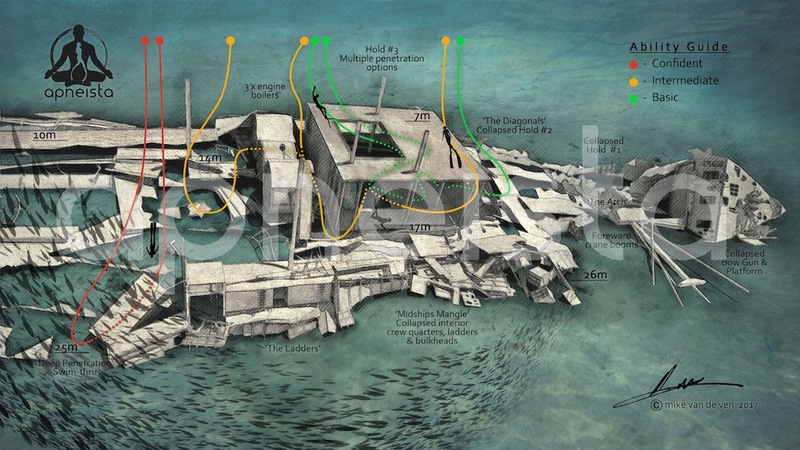 Though we might use his maps to this fantastic dive site to navigate, Mikes map converts our freedivers playground into an historical experience with vitality on a different level.